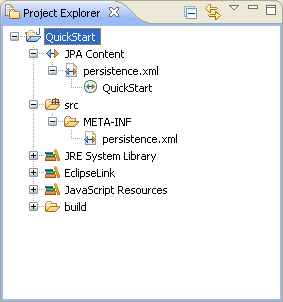 This quick start shows how to create a new JPA project. Select File > New > Project. The Select a Wizard dialog appears. You can also select the JPA perspective and then select File > New > JPA Project. Select JPA Project and then click Next. The New JPA Project page appears. Enter a Project name (such as QuickStart). If needed, select the Target Runtime (such as Apache Tomcat) and configuration, such as Default Configuration for Apache Tomcat and then click Next. The Java source page appears. The Target Runtime is not required for Java SE development. If you have existing Java source files, add them to your classpath and then click Next. The JPA Facet page appears. On the JPA Facet dialog, select your vendor-specific JPA platform (or select Generic 2.0), JPA implementation library (such as EclipseLink), database connection (or create a new connection), define how Dali should manage persistent classes, and then click Finish. Select Override the Default Schema for Connection if you require a schema other than the one that Dali derives from the connection information, which may be incorrect in some cases. Using this option, you can select a development time schema for defaults and validation. Eclipse adds the project to the workbench and opens the JPA perspective. Now that you have created a project with persistence, you can continue with Creating a Java persistent entity with persistent fields.